This is a guest post from Adam Ford of theDigitalLifestyle.tv. How do you make the Zune better? Well, naturally you add the ability for it to police your content for anything pirated. What’s so wrong with that? You shouldn’t be pirating music or videos, has the RIAA not taught you anything!?! The story goes that NBC abandoned ship because of Apples tight leash on pricing and their unwillingness to police pirated material. Apparently Microsoft is okay with NBC selling their content for the same price as Apple would have just as long as Microsoft absorbs the difference in cost between that price and the price NBC wants to sell it for. Lets look at that for a moment. If Apple was going to sell an episode of Heroes for $1.99, and NBC wanted to sell that same episode for $6.99 then Microsoft is basically paying NBC $5.00 for each download. I really can’t imagine why Apple wouldn’t want to do that . . . seems like a GREAT business deal. As if that decision wasn’t confusing enough, Microsoft is working on what I can only assume will be an update to it’s desktop software, to detect bootleg media and disallow it from being transfered to the device. My question: How does it know? This is the age old question of the thermos. The thermos keeps hot stuff hot and cold stuff cold . . . but how does it know? When I go out and purchase a DVD and use good old handbrake to make a legitimate backup how is the software going to recognize this as being legitimate and allow me to put it on my Zune (DISCLAIMER: I don’t have a Zune, don’t want a Zune, and this whole thing seems like a giant disaster)? As you can see the move to police your library raises all kinds of concerns. I don’t see how this approach really sells more of anything for Microsoft. It seems like they’re going to lose money on each download AND push the Zune in a less desirable direction (as if poop brown wasn’t enough). I think I’ll just keep my iPod. theiLife is proud to announce that we served an AJAX based liveblog during WWDC with no issues- and saw over 40,000 unique visits to the website. More stats coming soon. 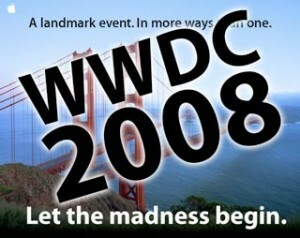 Check out some articles about WWDC. This week is yet another normal week for me, so you should see the site full of content all week. My school is ending on Friday- this means I will be officially done with school for the summer. In Apple related news, last week, Apple officially ran out of iPhones online (and in most retail stores). This should certainly foretell future events with the second generation iPhone and it’s upcoming release. Finally, last Friday, I received an invitation to try out Schmaps for the iPhone. After playing around with the private beta, I recommend you check out the now public beta here. Schamp is a great service and the implementation on the iPhone is slick. Have a great day!